I've been with my company since 2011 - my first summer home as a college kid, where I worked 3 days a week as a floater helping others with any overwhelming loads of work they had. Now that I'm a college grad, I finally had the pleasure of becoming a full time employee. That's right, I went from no desk, to the "extra storage cubicle", to finally my own work space. With that being said, I made myself at home. I created an environment that is not only cozy and cute, but most importantly, it represents me. 2 months later & my DIY desk makeover is finally complete. I'm so excited to tell you about how I did it, and inspire you to fix up your own. 1. Pick a color and a metallic. Teal blue is my favorite color of all time. Gold is my favorite metallic, but since I had leftover grey and white chevron wall paper from a previous project, I decided to go with silver instead. 2. Go spray paint crazy. It was originally much taller in length as seen below, so I cut the remainder in half to resemble a border instead. You can find peel and stick wallpaper almost anywhere from $12-$15, also known as "Wallpops". 4. 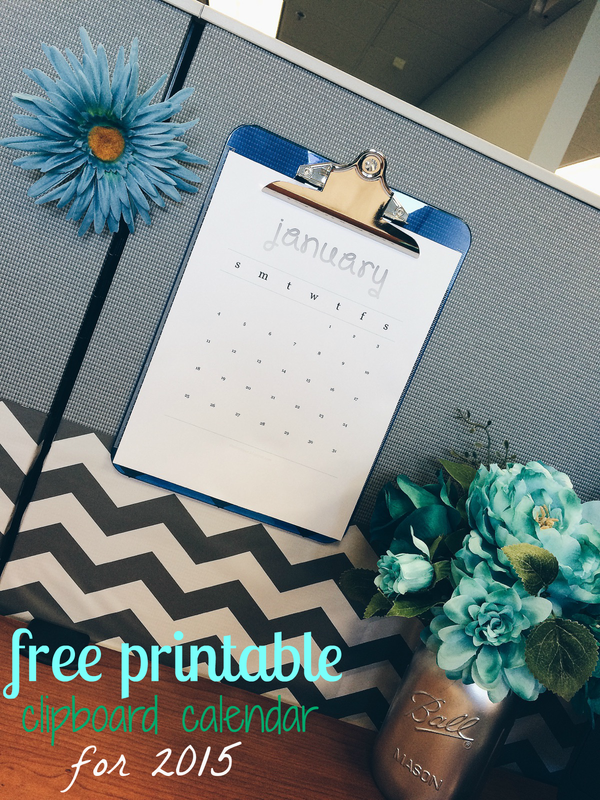 Purchase a clipboard & download my printable 12 month calendar for 2015. 5. 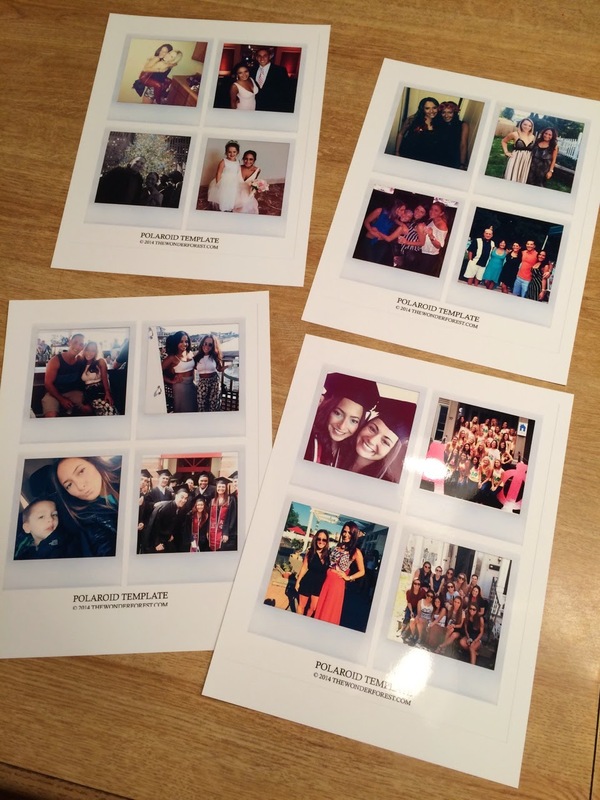 Show off your favorite pictures by turning them into Polaroid photos. I'll show you how I did it here! 6. Frame your work notes. 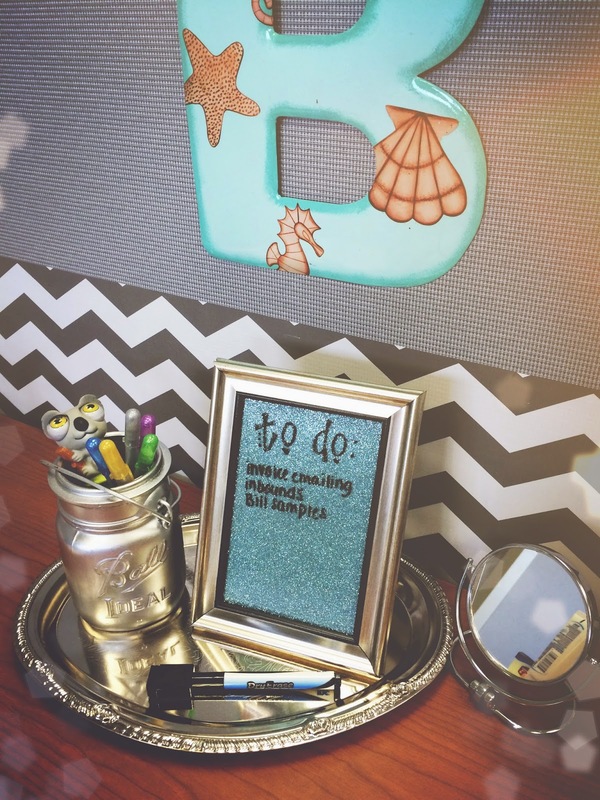 I know you have at least 5 post-its surrounding your work space with information you refer to every day. Even if its a phone extension list, type it all up, and frame it! The dollar store has tons of 8.5" x 11" photo frames. 7. 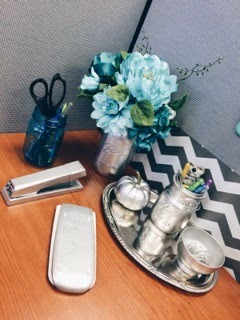 Check out my other desk makeover tutorials. 8. Don't forget your before & after shot! 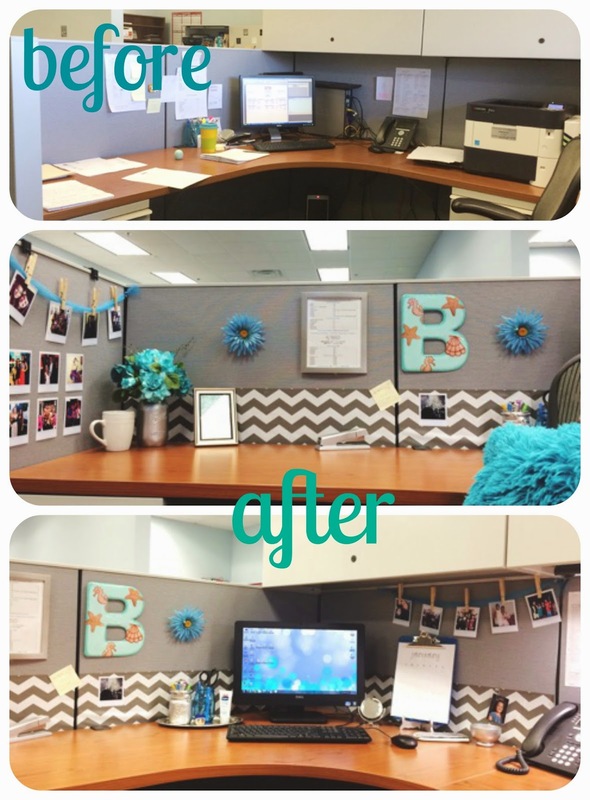 18 comments on "My Office Cubicle Makeover"
how tall is the wallpaper? about 17" :-) I cut it in half to resemble a 8.5" border. 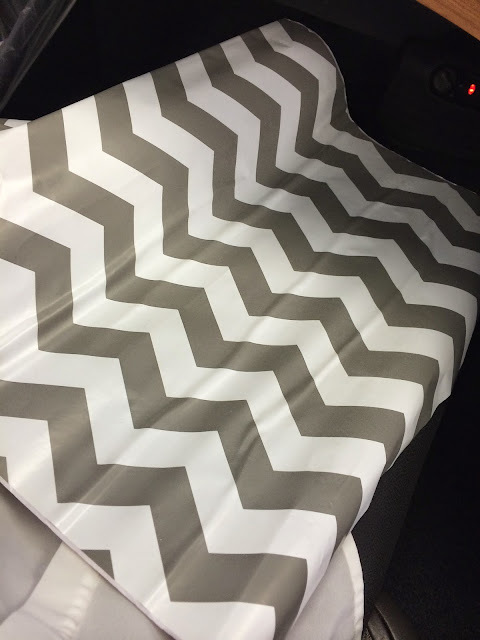 How thick are each of the "lines" in the chevron liner? Your photo makes them look nice and thick without being too large, but on Amazon it looks much thinner! The fabric in my cubicle is very flimsy, how did you managed to make everything stay? I thumb-tacked the tops every few inches, maybe every 12 inches, because it had trouble sticking to fabric wall. If you don't have a fabric cubicle, tape could work! I use shower curtains for the walls of my cubicle. Interesting patterns - very affordable - and can be changed out easily. Whatever works! 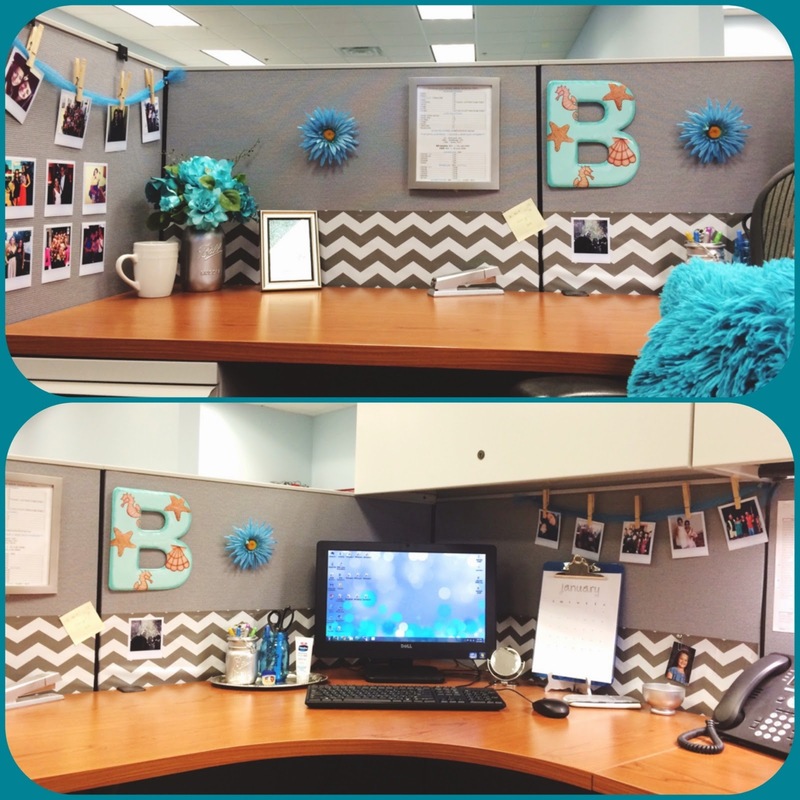 :) I love the idea of personalizing your work space! Looks really pretty. Thanks for sharing. You just given me an idea how to decorate mine. Check out http://cheapgadgetsstore.com/work-station/ for affordable workstation/workspace.